Who knew Portland, Oregon (or PDX as it was referred to everywhere) was a mecca for knitters (and crafters in general)? Aside from a vague idea of what Portland was like (hipster, eco-centric beer & coffee country), I knew nothing of the city other than that I wanted to visit it for its proximity to home (2 hr plane ride with baby D for the first time!) and to see a friend. Then that friend sent me info on the Rose City Yarn Crawl. What the heck was a yarn crawl, anyway? Yowza—an organized event to lure knitters into all the various yarn stores in the city! Unfortunately, timing didn’t work out in my favor but I loved the idea and decided to do my own mini yarn crawl. I’d visit yarn stores as a reason to check out the various neighborhoods of Portland! I managed to visit 1-2 stores in each major area of Portland (NE, NW, SE, SW) and every store had a unique flavor. Coming from the airport, I visited Close Knit on Alberta Street (x 22nd Ave) in the blue-collar hipster NE area of Portland. 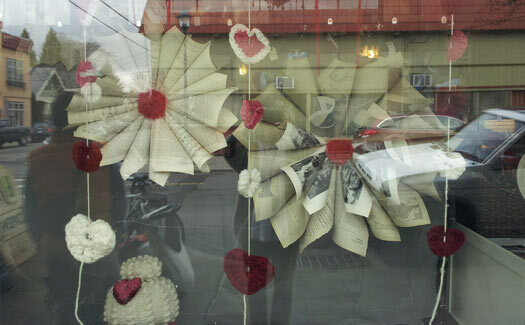 The first thing I noticed about the store was its window display—it was artful and crafty and so much more attractive than most other yarn stores! On the inside, Close Knits is a cozy little shop with yarns along the walls and on tables marked by a tasteful selection of knit samples on display throughout the space. I wanted to knit almost every pattern that was shown! Dream Stripes Shawlette in a great mix of dark teal and taupe; Les Miserables in a medium dark grey, Nash’s Garter Stitch Baby Sweater from One More Skein: 30 Quick Projects to Knit in a sophisticated, unisex heathered brown color…those are the ones I remember but I wish I took pictures so I could remember what else there might’ve been. I wanted to visit Close Knits because it was listed as a retailer of ChiaoGoo needles and I was on the hunt for ChiaoGoo’s Twist Interchangeable set. Sadly, they didn’t have the set but the owner was nice enough to let me handle the fixed circular needles she did stock. She was very friendly from the moment I stepped in until I left, offering to order the set for me though I declined. I would’ve gone back for another visit but I didn’t have enough time. Just another reason to go back to Portland! I’d recommend visiting two eateries while in this neighborhood: Bollywood Theater right down the street from Close Knits (off 21st Ave) for delicious Indian food and the ginger-spiciest chai I’ve ever had (perfect for a cold, damp day) decorated in Indian kitsch. 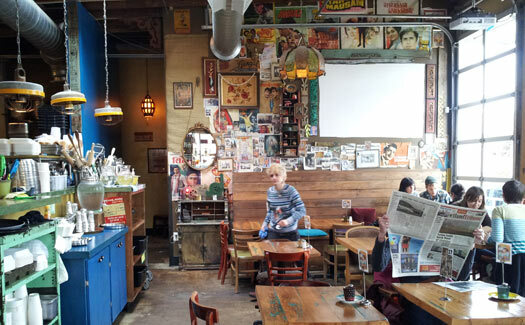 For strong, tasty coffee and delectable breakfast fare with meat and vegetarian versions of their dishes across the board, there’s Radio Room (x 11th Ave). It had a Johnny Cash-cool vibe with cushy, black leatherette booths and a bar room next door to the restaurant. Either of these places would be perfect for a small knitting group—Radio Room’s bar would be awesome for a drink & knit fest. 2 Responses to Knitter’s guide to Portland—the N.E.